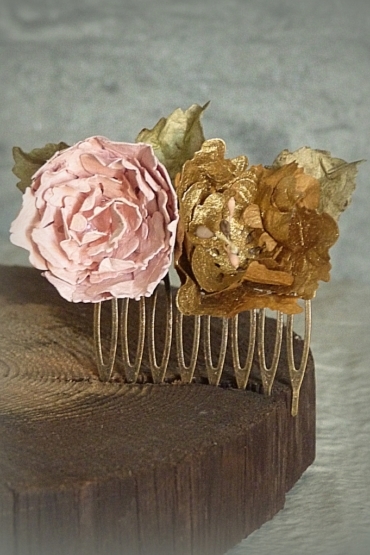 Duo of flowers puts on a golden metal hair clips. Made of Japanese and Italian paper flowers and Italian paper leafs. Vintage tints with off-white pistils. Handmade in Paris Paris in Olga Vallecillos atelier and in exclusivity for Donatelle Godart-Paris. Dimensions : 7 cm. Composition: Brass comb, tulle of wool and paper. Color: Golden and ivory. Delivery time: 3 to 4 weeks. 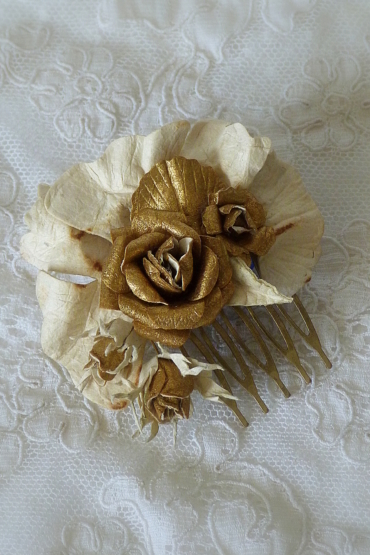 Crown puts on two golden metal combs of 12 branches each and a metal base surrounded by an ivory satin ribbon. Made of Lokta paper flowers, Lokta paper leafs, Japanese and Italian paper. Vintage tints with off-white pistils. 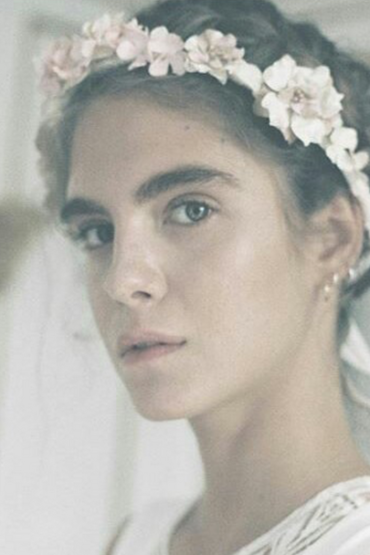 Possibility to add a veil. Handmade in Paris Paris in Olga Vallecillos atelier and in exclusivity for Donatelle Godart-Paris. Dimensions : 38 cm. Composition: satin ribbon, japenese, Lokta and italien paper. Color: Golden, ivory and off-white. Delivery time: 3 to 4 weeks. Brass comb of 5 branches surrounded by tulle of wool. Made of Lokta paper flowers, Lokta paper leafs and golden Lokta. Vintage tints. Handmade in Paris Paris in Olga Vallecillos atelier and in exclusivity for Donatelle Godart-Paris. Dimensions : 7 cm. Composition: Brass comb, tulle of wool and Lokta paper. Color: Golden and off-white. Delivery time: 3 to 4 weeks. 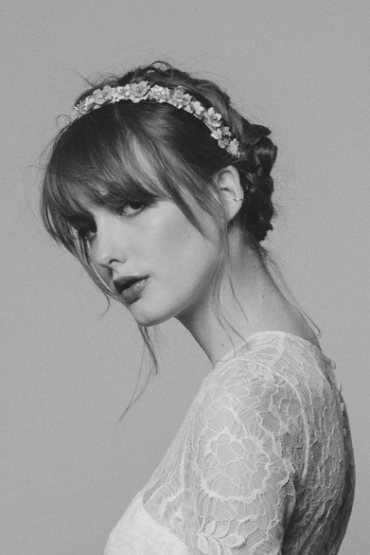 Headband puts on a metal base surrounded by a golden and ivory braid. 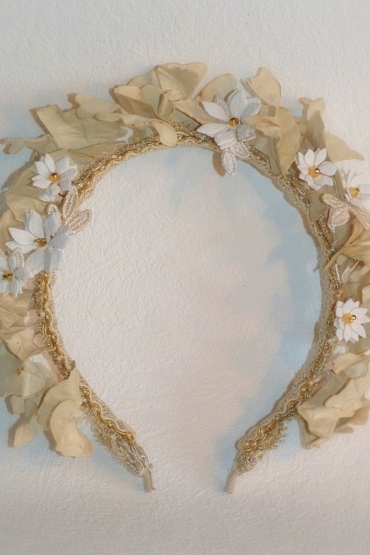 Made of Lokta paper leafs, embroidered off-white leafs, Italian paper flowers and Swarovski crystals. Vintage tints. Handmade in Paris Paris in Olga Vallecillos atelier and in exclusivity for Donatelle Godart-Paris. Dimensions : 38 cm. Composition: Braid, Swaroski crystals, Lokta and italien paper. Color: Golden, ivory and off-white. Delivery time: 3 to 4 weeks. Half-crown puts on a brass comb of 8 branches surrounded by tulle of wool and sisal. Made of Lokta paper flowers and paper leafs and golden Lokta. Colored with different shades of pink and gold. Handmade in Paris Paris in Olga Vallecillos atelier and in exclusivity for Donatelle Godart-Paris. Dimensions : 14 cm. Composition: Brass comb, tulle of wool, sisal and Lokta paper. Color: Pink, golden and ivory. Delivery time: 3 to 4 weeks. Brass comb of 8 branches surrounded by tulle of wool. Made of Lokta paper flowers, Lokta paper leafs and golden Lokta. Colored with different shades of powder pink and powder green, accessorized with pink and brown pistils. Handmade in Paris Paris in Olga Vallecillos atelier and in exclusivity for Donatelle Godart-Paris. Dimensions : 7 cm. Composition: Brass comb, tulle of wool and Lokta paper. Color: Pink, brown, green and golden. Delivery time: 3 to 4 weeks. 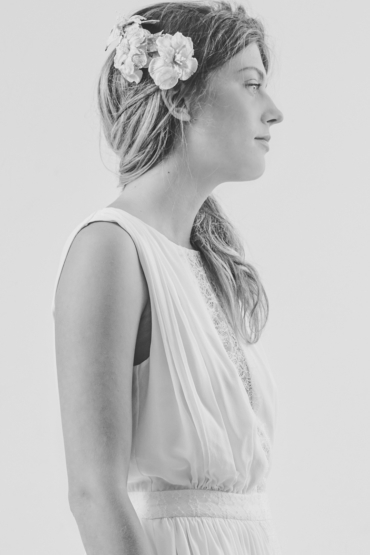 Headband puts on a metal base surrounded by an off-white cotton braid. 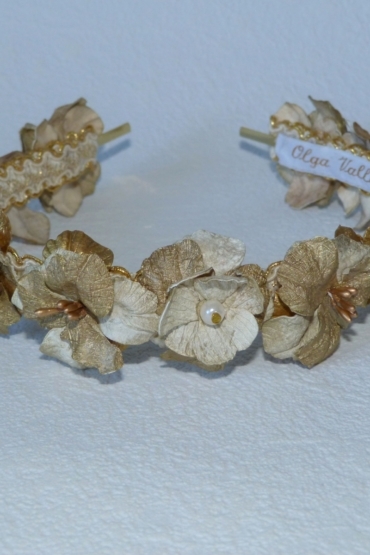 Made of Lokta paper flowers, golden Lokta and Italian paper. Vintage tints with golden pistils. Handmade in Paris Paris in Olga Vallecillos atelier and in exclusivity for Donatelle Godart-Paris. Dimensions : 38 cm. Composition: Cotton braid, Lokta and italien paper. Color: Golden, ivory and off-white. Delivery time: 3 to 4 weeks. 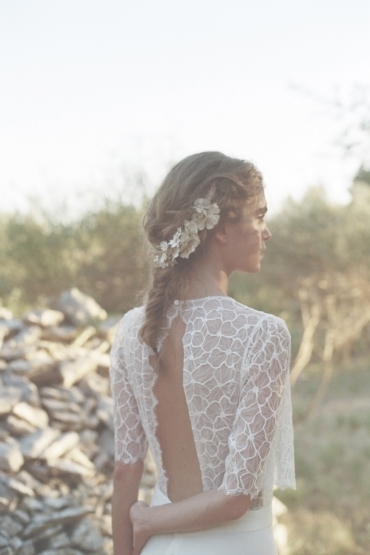 Headband puts on a metal base surrounded by a golden and ivory braid. Made of Lokta paper flowers, golden Lokta and Italian paper. Vintage tints with pearly pistils. Handmade in Paris Paris in Olga Vallecillos atelier and in exclusivity for Donatelle Godart-Paris. Dimensions : 38 cm. Composition: Braid, Lokta and italien paper. Color: Golden, ivory and off-white Delivery time: 3 to 4 weeks. Half-crown puts on a golden comb of 20 branches wrapped by a golden ribbon. Made of Lokta paper flowers and paper leafs and parchment. Vintage tints and golden pistils. Handmade in Paris Paris in Olga Vallecillos atelier and in exclusivity for Donatelle Godart-Paris. Dimensions : 15 cm. Composition: Tulle of wool, ribbon, Lokta and parchment paper. Color: Golden and ivory. Delivery time: 3 to 4 weeks. 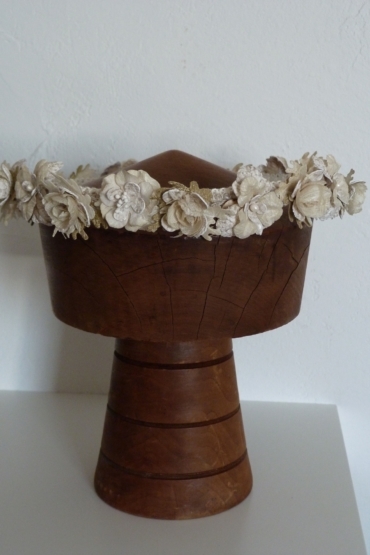 Closed crown puts on a metal base surrounded by an ivory cotton braid. Made of Lokta paper flowers, Lokta leafs, Japanese paper and Italian paper. Vintage tints with pearly and off-white pistils. Handmade in Paris Paris in Olga Vallecillos atelier and in exclusivity for Donatelle Godart-Paris. Dimensions : 59 cm. Composition: Cotton braid and japanese, Lokta and italien paper. Color: Golden, ivory and off-white. Delivery time: 3 to 4 weeks. Crown puts on a metal base surrounded by tulle of wool and sisal. Made of Lokta paper flowers. 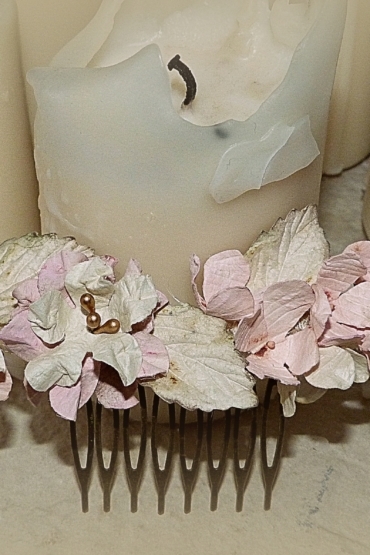 Colored with different shades of powder pink and ivory with golden and off-white pistils. An ivory ribbon closed the crown. Handmade in Paris Paris in Olga Vallecillos atelier and in exclusivity for Donatelle Godart-Paris. Dimensions : 50 cm. Composition: Tulle of wool, ribbon, sisal and Lokta paper. Color: Pink, golden and ivory. Delivery time: 3 to 4 weeks. Half-crown puts on a golden comb of 20 branches wrapped by a golden ribbon. Made of Lokta paper flowers and paper leafs and Italian paper. Vintage tints, golden pistils and pearly pearls. Handmade in Paris Paris in Olga Vallecillos atelier and in exclusivity for Donatelle Godart-Paris. Dimensions : 15 cm. Composition: Tulle of wool, ribbon, Lokta and italian paper.. Color: Golden and ivory. Delivery time: 3 to 4 weeks.